*McDonald (CDN PBRAF# 18-9479) and Wepster (CDN PBRAF# 18-9480) are licensed varieties of Oregon State University and protected both by patents in the US and Plant Breeders Rights in Canada. Purchasers of these varieties are not allowed to propagate for either further sale or expansion of orchards. Illegal propagation will be prosecuted. 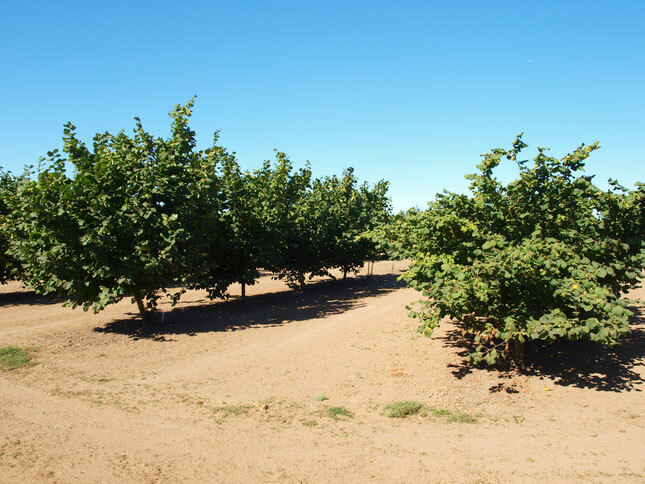 We offer the new Eastern Filbert Blight resistant hazelnut trees developed by the Oregon State University breeding program. We currently grow 13 hazelnut cultivars with attributes such as high yields, early harvest, and better nut fill, and smaller stature along with EFB resistance. We also grow a limited number of other perennial plants, mostly natives and edibles suitable for agroforestry and permaculture, and offer contract growing, custom micropropagation/tissue culture and consulting services. Our nursery is not set up for drop-ins, so please contact us in advance if you want to arrange a meeting. Grower's in Oregon are planting thousands of acres of new, blight resistant, hazelnut orchards each year. Popular varieties include Jefferson (left) and Yamhill (right).